It has always bewildered me that there is such an array of rules across the Prison Estate. I get that there has to be rules. I get that different establishments might have differing rules to suit the type of prison they are or to deal with any particular issues that they have locally. And yet prison rules have still long baffled me. From the sign on a door that prohibited visitors bringing in, inter alia, “door stops and ladders” (how could a prison be defeated by wedging doors open and who could ever smuggle a ladder in?) to the prison that made me drop my trousers (a very long and not particularly edifying story) to the prison that turned over every page of my brief because “we had someone trying to smuggle a doughnut in…”, prison rules are, well, a law unto themselves. In Manchester we briefly had “the letter of introduction”. This was a letter which basically had to say “Hello, this is Jaime, he’s a barrister, and today he would like to visit one of your guests, Burglar Bill.” A part of me always wanted them to have to finish with the phrase “and you shall let him pass without let or hindrance.” But they didn’t. Officer: Where’s your letter of introduction? Me: I haven’t got one. What is it? Officer: It is a letter explaining who you are and why you’re here. Me: Oh right. Never been asked for one of those before. Give me a moment and I’ll jot those details down on a piece of paper for you. Officer: No, that won’t do. It’s got to be from your boss. Me: I am self employed. I haven’t got a boss. I guess I am my own boss. So do you want it from me? Introducing myself? Me: I’ll just jot it down then, like I just said….. Officer: No! It’s got to be on headed notepaper. Me: Right, have you got a fax? Cos I’ll get some note paper faxed over and then I will write a letter on it formally introducing myself to you and sign it from myself to say it is deffo me. Officer: There’s no need to be arsey…. And so it went on. I didn’t get in the prison that day. But from that day forward I did carry a letter of introduction, like some emissary being sent on a diplomatic mission, and presented it at every prison I visited. Often I may as well have dropped my trousers (again) and shown my backside judging by the reception it got at most places. The letter of introduction now seems a thing of the past. Prisons feel no more or less safe. And in one of Machester’s prisons I can wear my watch as I visit a man on remand for murder and in the other prison I cannot wear my watch as I visit a man on remand for murder. I am sure this makes sense somewhere. Just not in the real world. My watch wearing is just an inconvenience. The real issue is which prison you can take your laptop or tablet into. Or, more importantly, what you have to do to be allowed to bring it in. 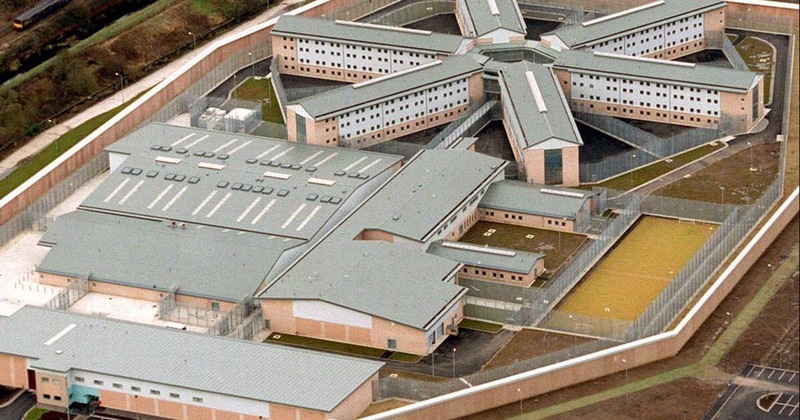 One prison requires 48 hour written notice, another prison just needs you to mention it when you book in whilst another wants a letter from the computer’s mother and an oath taken in blood and bytes that the computer is who you say it is. Today I represented a man who was moved from a prison in London to a prison in Manchester and then back to London for his hearing today. I have mentioned in a blog previously that prison food is so bad that prisoners are concerned that protein is missing from their diet. I have plenty of clients that order protein shakes from the prison canteen to make up the deficit. These people are not bodybuilders, they just lack protein. My client today had overcome this by ordering 150 tins of mackerel and tuna as part of his “canteen”. A prisoner’s canteen is the extra stuff they can buy with their wages. Often it is tobacco or sweets. This prisoner wanted protein and decent food so he stockpiled tinned fish in his prison in London. And he was eating it three meals a day, had to buy when it was available and he amassed 150 tins of fish. He then got transferred to a prison in Manchester. A prison that did not allow prisoners to have tinned fish…. Now I appreciate that this sounds like I am making it up, but I promise you I am not. So at the Manchester prison his tinned fish hoard had to be stored. And today, when transferred from Manchester to court in London, his canned fish had to be bagged up in several bags and brought with him to London, just in case he ended up in a prison that let him have a sardine or two. And yet in one prison you can buy tinned fish and in the other tinned fish is as prohibited as Class A Drugs and ladders…. The Criminal Justice System has become a disparate loose collection of different departments and entities, attempting to work together with little by way of overarching aims and guidance. I have no idea, from day to today, what I need to do to see a client, what I can take with me or whether they will be brought to court. And they have no idea whether Governor Antoinette is going to let them eat tinned fish or not. This disparate uncooperative co-op leads to delay and waste. And a man in the back of a prison van hurtling along the M6 with see-through bags full of contraband tinned fish. It has been a long day….. This entry was posted in Music and tagged barrister, courts, criminal justice, MOJ, prisons, solicitor on August 1, 2016 by jaimerhamilton. Being permanently connected to some form of electronic device I monitor social media more keenly than GCHQ. Over the last 48 hours I began to notice people complaining that CJSM, the criminal justice secure email service, was not working. The Ministry of Justice would like to apologise to CJSM users accessing the service through the CJSM website for the current poor performance of the service, There has been a growth in usage of the service over the pas few months beyond what was expected and over the last couple of months demand has outstripped the capacity of the service. I am going to let the typo “pas” pass without comment (he says in a passive aggressive way). I am even going to totally ignore the comma followed by a new sentence. This would seem a reasonable explanation. Save for the fact it is not. The MoJ have been involved intimately in the introduction of Better Case Management and digital working. This requires every participant in the criminal justice system to have a secure email. That means CJSM. So we have been exhorted by….errrr…the MoJ and their partners that we all need a CJSM account as a pre-requisite to use of PCU wifi and access to the case papers online. The growth in usage of the service was entirely and utterly predictable. It has been prompted by the actions of the MoJ. I am reminded of a teenager who throws a party when their parents go on holiday. They post the invitation to Facebook, Twitter and Instagram and are then surprised when it is not just their close friends that turn up but the entire school, seven drug dealers, 567 teenagers from neighbouring towns and a gang of Hells Angels from Holland. Actually my friend Brian will chastise me for that analogy because, in this instance, the MoJ have in fact invited the whole school, 567 teenagers and the Dutch biker gang. And then expressed surprise when they all turned up and trashed the house. As the Facebook teenager would observe – “epic fail”. And this is what worries me about digital working. Not the poor grammar. Not the poor excuse. But the lack of forward thinking that introduces a system of working that the system cannot cope with. As fans of Monty Python know, no one expects the Spanish Inquisition. Yet when you tell everyone to get a CJSM account as pre-requisite to participating in the criminal justice system, you really do have to expect every participant will get a CJSM account. The MoJ must do better. Again. This entry was posted in law and tagged barrister, cjsm, dcs, digital working, MOJ, ptph, secure email, solicitor on March 10, 2016 by jaimerhamilton. A little like Pammy and Bobby Ewing, Michael Gove has woken up, found common sense was having a shower and it is as if the last two years have just been a dream. Except it was not a dream. Grayling was, and remains, a grim reality for the legal profession. I thought that when….. no, if the day came when TT was abandoned and there was some positive news regarding the cuts I would punch the air and organise a street party outside chambers with trestle tables, egg and spoon races and a New Orleans Jazz Band. When the news came I found I had very little appetite for celebration. Why? There are many factors. It is difficult to celebrate when I know many have already been lost to the professions due to the uncertainty and the financial peril caused by the cuts. A small proportion of the damage foretold has already been caused. And that has affected people adversely. If Grayling was capable of shame it should burn in his heart like the sun in the sky. I also cannot help but feel this was a self inflicted defeat rather than a victory. I have no doubt that the various fronts of opposition have had their toll on the MoJ. I do not doubt that those with the ear of the new Lord Chancellor have been making a forceful and effective case. I do not doubt that Gove has an understanding of things better than Grayling was ever capable of. Yet I am left with the feeling that, had the MoJ been capable of organising a wine tasting in the Vintners’ Society, TT would have been introduced. And the damage has been escaped by happenstance rather than endeavour and . The most significant factor is the state of the CJS. Gove’s statement was a giant leap for solicitor-kind but a small step for the delivery of a just justice system. It was a positive but one that did not stop the papers being served late/incomplete/not at all in countless cases today. It did not suddenly cause the videolink equipment to work in the vulnerable witness’s case in the Crown Court at Breaking-Point-on-Sea. It did not inject the funds required to properly investigate, prosecute and defend cases. And that is why I cannot celebrate. We have so many more battles to fight. So many more victories to win. And we cannot always rely upon those in the wrong shooting themselves in the foot. This entry was posted in law, Politics and tagged barristers, dual contracts, duty contracts, gove, Grayling, legal aid, lord chancellor, MOJ, solicitors, two tier on January 29, 2016 by jaimerhamilton.